The award winning Britannica Pathways: Science provides 100 highly flexible lessons across 10 topic areas that get children working scientifically. When exploring through a Pathways lesson, students build up a body of key foundational knowledge and concepts while evaluating evidence, using scientific vocabulary, creating arguments and expressing how their ideas have developed through research. Pathways delivers a variety of content formats from text to audio and video making it the ideal, flexible resource for supporting different types of learner. It encourages critical thinking, challenges misconceptions and encourages discovery. Covering the key principles, foundations and concepts of science required at KS3, Pathways is often used to help smooth the transition from primary to secondary education. Benefit from reduced planning time and ready to use examples, the ability to track children’s progress and the flexible learning provided by Pathways. Aligned to the national curriculum, Pathways is the perfect addition to schools’ STEM programmes. How can I download more information? 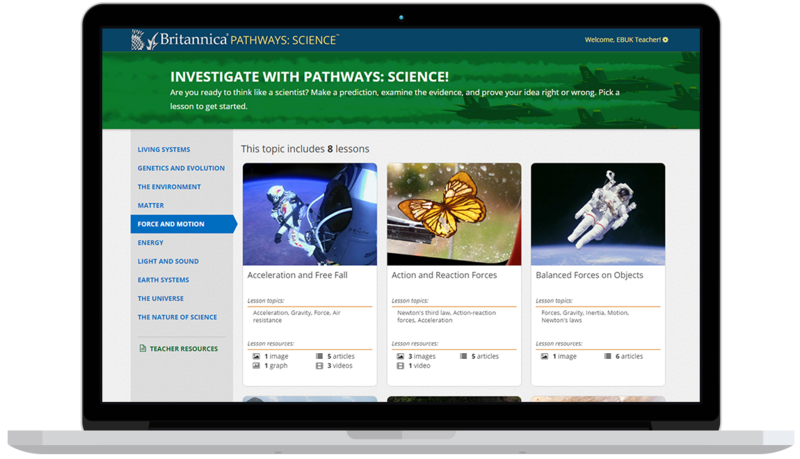 How does Britannica Pathways: Science, support science curricula and teach students how to work scientifically? How do teachers and pupils access Britannica Pathways: Science? Can I copy or reuse content in my own work? How can we integrate Britannica Pathways: Science? How will the Britannica team support my subscription? How does Britannica Pathways: Science, support science curricula and teach students how to work scientifically? Britannica Pathways: Science offers 100 highly flexible lessons in biology, chemistry and physics with valuable opportunities for students to make predictions using prior knowledge, analyse information, draw evidence-based conclusions, and write arguments to support their claims. Students use enquiry-based, interactive explorations to transform their misconceptions into true understanding. Teachers can track student answers and use the built-in assessment to best meet students’ needs. How do teachers and pupils access Britannica Pathways: Science? Both teachers and students can use their username and password to access Pathways: Science wherever they have access to the internet. We recommend putting a link on the website and/or on your school science page. Pathways: Science includes access from home so students and parents can work closely together. How can we integrate Britannica Pathways: Science? Because Pathways: Science uses a unique username and password for each user, no integration is necessary. Pathways: Science is also hosted on the Britannica servers and therefore accessible on any device, wherever you have access to the internet. For further technical support, please contact Britannica on +44 (0)20 7500 7800. This service is available Monday through Friday from 9am to 5pm UK time.